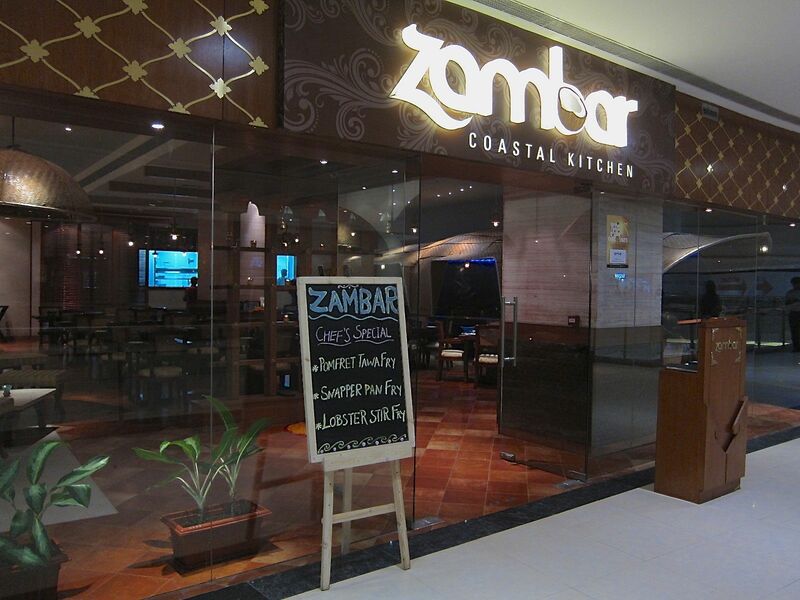 Zambar is located on the top level of Phoenix City Mall. 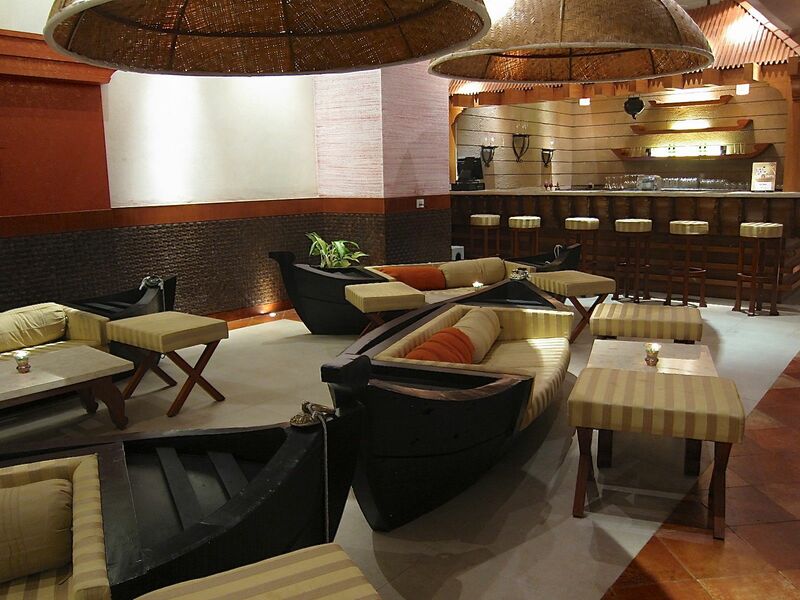 The interiors are creatively designed to remind you of God’s Own Country. Both the lounge area and the main dining area has interesting furniture in the shape of boats. Its interiors are enhanced by the woven bamboo mats, lanterns and traditional brass lamps that hang from the ceiling. The menu itself is very exhaustive. Zambar celebrates the cuisine of the four South Indian states. We decided to settle for the Non-Veg thalis (they have four different thali options here). 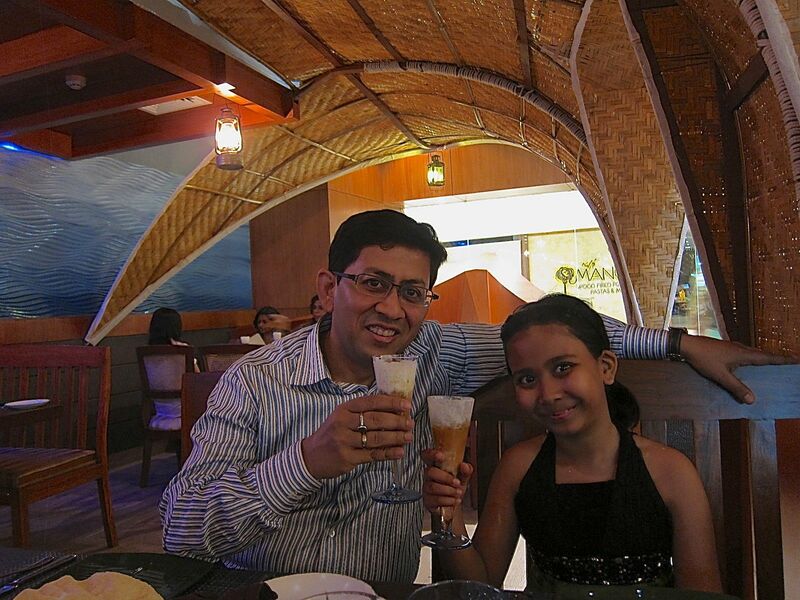 They started us with complimentary glasses of rasam topped with butter milk foam. The rasam was spicy and hot in a way that I like. I had ordered a glass of buttermilk which was wonderful too, with its subtle flavors of heeng and ginger. They also served a plate of poppadums and dips that we greedily polished off before the thalis arrived. The thalis looked very appetizing and pretty with its traditional brass bowls filled with a multitude of meat and vegetable preparations. 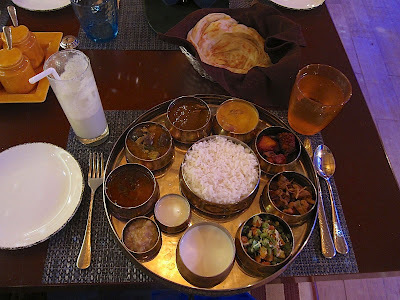 The contents included Chicken 65, Special Chettinad style roasted masala Sambhar, Vegetable Khurma, Poriyal with carrots and beans cooked in coconut gratings and yogurt. 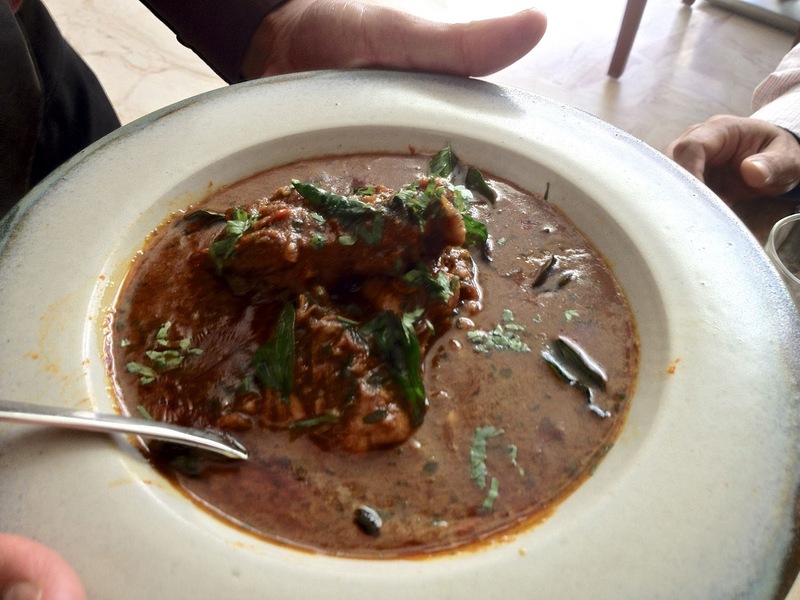 Then there was Chicken curry cooked Chettinad-style with special Chettiyar black pepper, marathimukku and kalpasi chicken. Kalpasi is one of the more exotic Indian spices that gives Chettinad Chicken its unique and mysterious flavor. Kalpasi, also called black stone flower is a dried lichen few know of. However, its use can be found in spice mixes in other parts of India too. 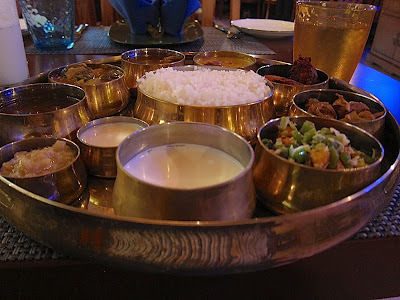 The thali also contained Mutton Kolazambu, Rasam and Curd. The Moong Dal Payasam along with the Coconut and Jaggery Pudding rounded off the desserts. The large bowl of rice in the center is a special breed of rice from Tamil Nadu called Ponni Rice which means ‘rice that is like gold’. We loved almost everything in the thali. The dishes were cooked to perfection, the meats were succulent and well marinated, and the flavors and textures contrasted nicely. For those looking for other options than a thali, I recommend the Non-Veg Platter of Chicken 65, Tamil Mutton Roast, Bedakai Tulsi Chicken, Mutton Coconut Fry. Or the seafood platter with Crispy Fried Prawns, King Fish Tawa Fry, Squid Chily Fry, Chettinad Crab Masala. The Appams and Malabar Parotha were pretty good too; not many get them right. Finally, we ordered some extra strong Filter Coffee that was terrific too. We usually pop into the lower basement outlet of South Indies for our fix of coffee. However, this was was less milky and just the way I love my South Indian coffee. 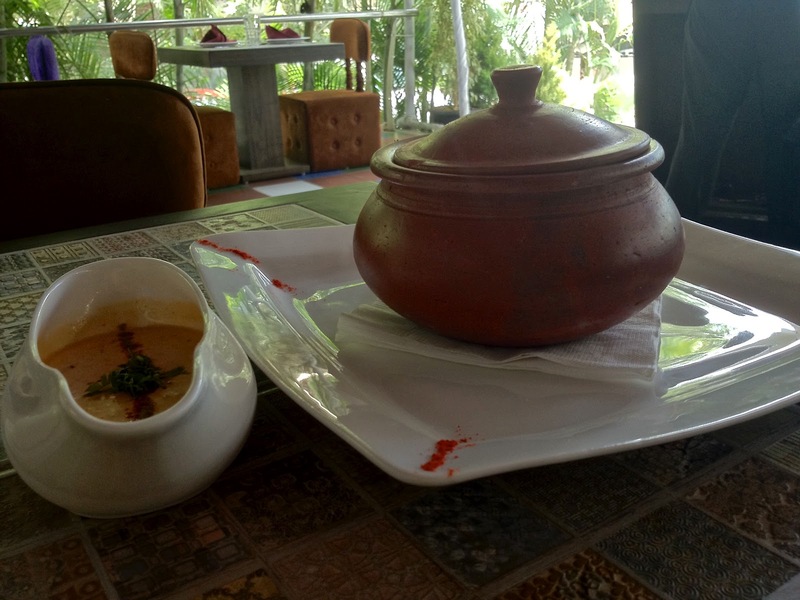 Overall, a great place for good food in chic, contemporary surroundings. Give it some love folks! The next restaurant I will review is on the other side of town. 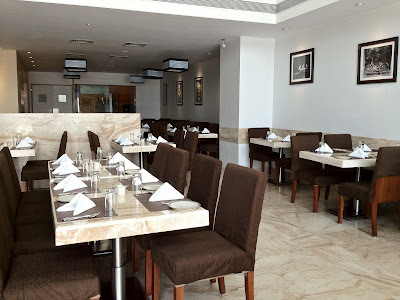 Located on the Baner-Pashan Link Road (the road that goes right around the large Symantec building on Baner Road), Volare has a clean, modern and airy look. The menu boasts of Indian, Chinese and Italian staples. I can only attest to their Indian food right now which was surprisingly good. 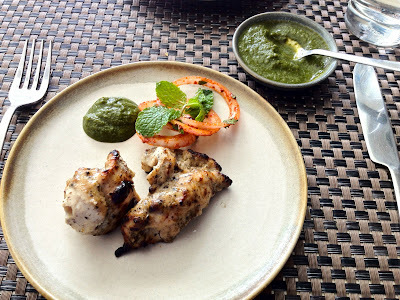 We ordered the Siyamirch Murgh Kababs followed by Mirch Pyaaz ka Kulcha with Chettinad Chicken. 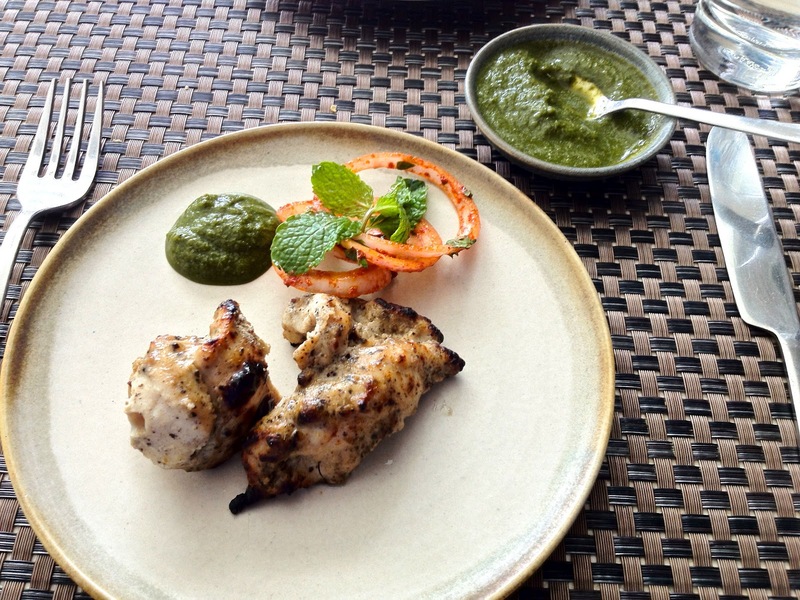 The Siyamirch Murgh, a kabab marinated in a mixture of yogurt, coarsely ground black pepper, ginger and coriander was perfectly turned out. The Chettinad Chicken with its traditional South Indian spices was delightfully spicy too, even if not completely authentic in its preparation. The breads were stand-outs. 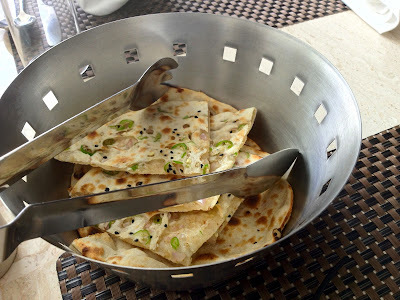 The Kulcha was very good, as were the other Rotis we tried. Overall, this restaurant was quite a revelation. I probably would rate their Indian food higher than Great Punjab on Baner Road. Finally, Kababish. The name intrigued as does its large list of kababs and grilled meats. 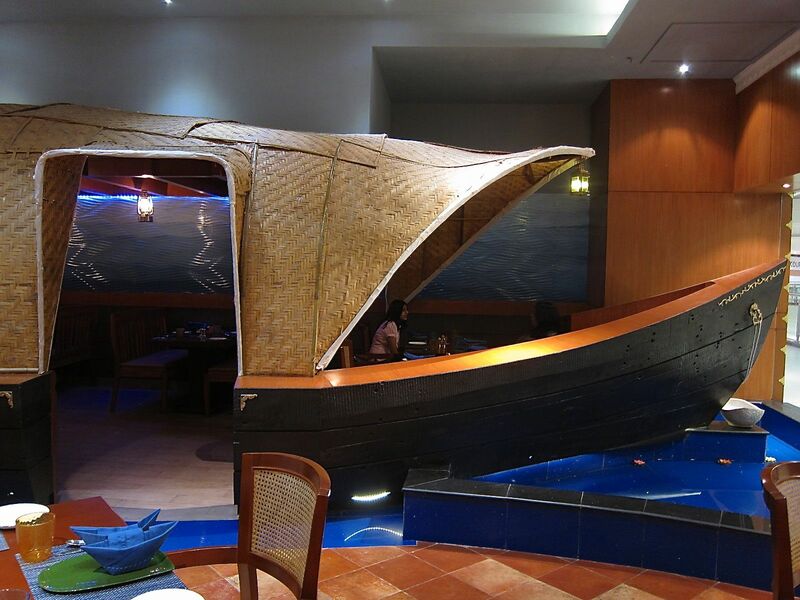 Located in the City Tower complex at the end of Boat Club Road, this is a new al fresco dining option for lovers of kababs and grilled meats. 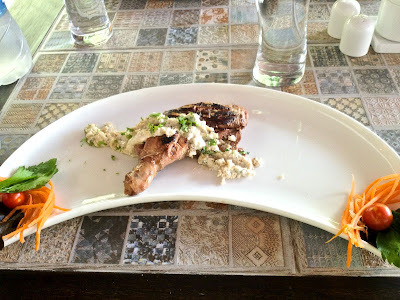 We ordered the Onion Chutney Leg, a grill of a leg of chicken marinated in special spices and topped with a chutney made of cream and onion. While the dish had promise, the execution wasn’t up the mark. The meat was unevenly cooked and the topping too creamy in my opinion. Next came the Mutton Biryani in an earthen pot. Here too, the dish was not exactly the way I love it. 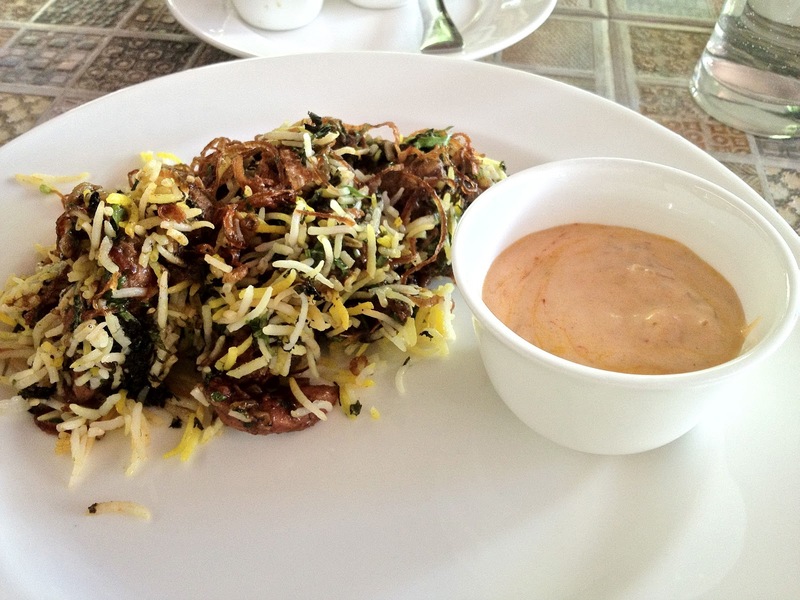 The biryani was too oily and over-garnished with fried onions. However, the meat itself was tender and tasty. 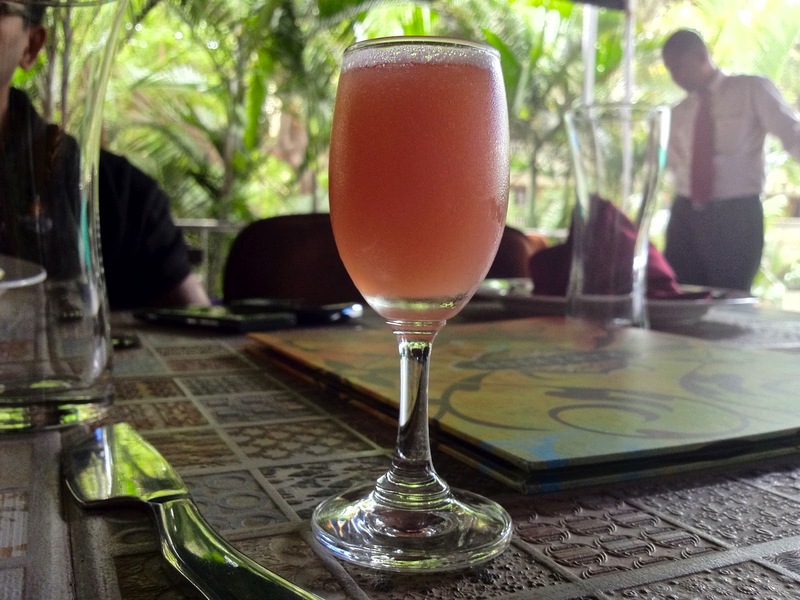 For other Pune restaurant reviews, please click on the label PUNE DINING below. @Lazy Pinapple: Do share your feedback once you visit. And loved your blog! Sir, We have a recently launched a travel and lifestyle magazine 'Elite Traveller'. wanted to discuss and explore possibilities. Do let me know your contact details, enabling me to discuss more. I am based in Pune. My handheld +91 9730625547. @Aditya: Thank you but I do this as a hobby; not looking for writing opportunities. Sir, I know, and I also understand your pre-occupation with business, Its not about being commercial but we can atleast take your writings or articles which are special to you can be published with your name. do let me know. @aditya: I will call you when I am back in Pune. Sir, Will wait for your call, I am reachable on +91 - 9730625547.